Candi Staton’s emergence as an artist in R&B and soul placed her among a cadre of women vocalists who brought a street level dose of realism to the relationship song. Now, those relationships might be about that splendored thing called love because Staton’s peers like Millie Jackson, Betty Wright, Jean Knight and Shirley Jones could sing about romantic love with the best of them. However, these artists specialized in singing about life from a woman’s point of view. These artists never cast themselves as passive victims. Rather it meant that the protagonists in songs by these artists were active participants in life who had agency – sexual and otherwise – and that they consciously and willfully acted on that agency. Wright sang about realizing too late that one woman’s trash was another’s treasure (“Clean Up Woman”). Knight let her man know that she was on to his game (“Mr. Big Stuff”). Jones made a phone call and informed the lady on the other end that the man she called herself being with was spoken for (“Woman to Woman”). Jackson, well, she pretty much covered it all. The inspiration for cuts like “Young Hearts Run Free” came from what artists such as Staton heard women talking about at the beauty shop, church, work or on the neighborhood porch. Staton had a devoted following among women who understood from hard experience the Alabaman’s critiques of patriarchy, as well as the myriad of factors in Staton’s life that made getting up and walking out easier said than done. The release of Unstoppable, Staton’s latest album, shows that with all the twists and turns that have happened in her life, this performer keeps keeping it real. Those who didn’t follow Staton when she returned to gospel in the early 1980s might wonder where the spiritual component that drives tracks such as the “Love Is You,” or “Revolution of Change” came from. 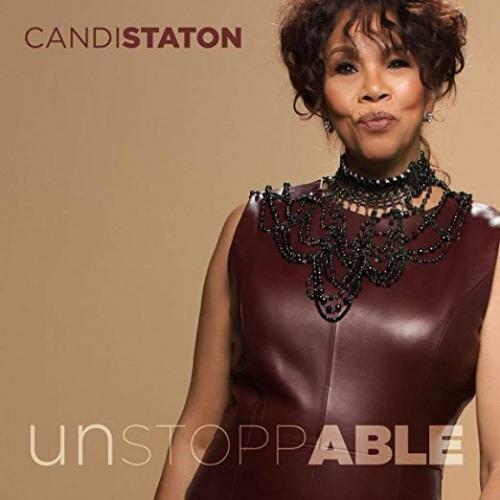 However, every track on Unstoppable reflects all of the transitions Staton has undergone during her long and distinguished career and explains why she can be as convincing covering Tyrone Davis’ “Can I Change My Mind,” as she is transforming “What’s So Funny About Peace Love and Understanding” from Elvis Costello’s the hard-charging rockabilly to a gospel-infused acoustic folk tune. Whether Staton is showcasing her ability to wrap a message of love in a disco-funk arrangement that sports lyrics that are spiritual but not sectarian on the aforementioned “Love Is You,” or channeling James Brown and Bobby Byrd over electric organs, a popping bass line and blaring horns on the funky “It Ain’t Over,” the one constant remains a voice that, while age has added some gravel, remains rangy and powerful. Staton spent more than two decades singing gospel before teaming up with producer Mark Nevers to release two critically acclaimed records, His Hands and Who’s Hurting Now. Where her 2014 album Life Happens found Staton return to her southern soul roots, Unstoppable is a project where Staton measures a career that moved from gospel, to soul, southern soul, back to gospel, country, and Americana, grabbing it all and saying, ‘I’ll can make something with all of these.” Solidly Recommended.